You ever have one of those moments where if you had done something just a little differently it would have changed the outcome of something major? There are a lot of what ifs out there and I do a lot of second guessing but I don't really dwell on things. But I was reflecting a little on the game I saw last night and thought I'd share something with you. The game itself was great. It stayed pretty close the whole time and I saw some good fielding. The hitting wasn't quite there as both teams left more than one runner on base per inning on average, frequently with runners in scoring position with no outs or one out, or the bases loaded. As I mentioned before, I'll share more of my baseball experiences with you later. Here's my real story: as a baseball fan and collector one thing I want to have is a game ball from each professional league, including all the minor leagues and foreign leagues. It's not impossible but very unlikely that I'll complete such a collection. I don't go out of my way to purchase them on eBay or anything, and while I went ahead and bought an NPB ball this spring I would like to have game used balls. I don't mind batting practice balls; I have plenty of minor and major league BP balls, many with different markings from game balls. And I mentioned that I was lucky enough to get a batting practice ball at Sunday's game. I also grabbed a BP ball on Tuesday. Both of these have very light markings, though. It's difficult to see that it's even a KBO ball, let alone be able to admire the markings. I've been to plenty of games and I know the odds of getting balls (BP or game used) are slim but I also usually pay close attention. I've often thought about the infinite number of possible ways a ball could come to me - lined or popped up, bounced off a wall or seats, a carom off the net, for instance. A foul ball at yesterday's game bounced off the upper deck facade and flew just overhead. I threw my hand up to try to catch it but it was a little too high. If I had stood up during the foul ball to watch it, I could have easily caught the ricochet. But I didn't. And I didn't get the ball. This is my last pack of Opening Day for 2014. Normally I'd do my monthly wrap-up, but since I'm in Korea, I'm going to skip it this month. This is my second Fired Up insert. Again, a cool concept though not something I'm too interested in personally. And that's it! In five packs I pulled cards from five different insert sets, plus of course the base cards. I like opening these packs due to the low price point and fun chase cards, but I never bother putting together a set. After looking at a lot of dark BBM and Calbee photos, the bright crisp photos Topps uses is a really good change. There's a lot I'd change about Topps, but the images on the cards are of much higher quality! Let's see... it's Tuesday so I'm leaving Seoul for the central part of South Korea. I should be at a baseball game soon, given the time difference. It'll be my first or second game, depending on whether Sunday is a rainout. How's this for coincidence! 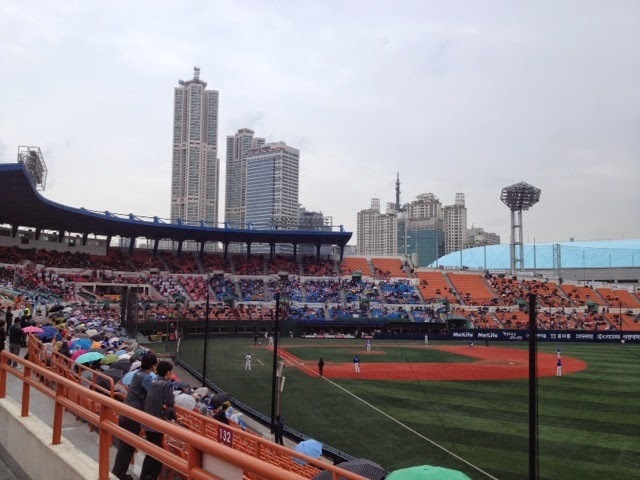 A Korean rookie when I see my first (or second) Korean baseball game! I really should put together a small Japanese Players Who Played/Are Playing in the MLB Collection. Mascots. Japan is packed with them. The MLB teams do them about half-right. Video of the day. When I used to post frequent videos, Bad Lip Reading was just getting its start. They're finally back with a long clip from Twilight III, a movie I am pretty sure I'll never see. Happy Monday! I should be at Lotte World, Korea's most famous amusement park. It's the Disney of South Korea, if a little less happy. If this were BBM, CJ would still have the ball, in the early part of his windup. These don't scan well, but I like the 3D inserts Topps has been creating for the past few years. It looks like Morales' teammates are encouraging him to reach the plate. "Come on, just four more steps! You can do it!" Or, even funnier, telling him to stay away. "Go back! Quicksand! Snakes!" He needs to have me as an English teacher! I was seriously worried about the weather today. It was supposed to rain, and it did. But somehow it stayed just light enough to get a whole game in! 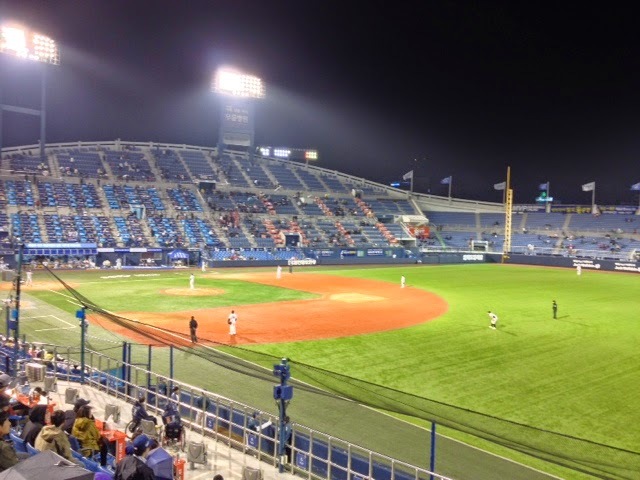 I'll describe the stadium and post pictures and such on my other active blog in the future, but I wanted to share my excitement in finally seeing a KBO game. That just leaves China, The Netherlands, and any Central or South American countries. And Australia. And any others I don't know about. If plans work out right I'll go to five more games this week, all at different stadiums! Pack Number Two. I leave today for Korea! By the time this post goes live it'll be the afternoon and I'll be in Seoul. The weather calls for rain and I'm supposed to be at a baseball game, so it looks like it'll be a dull first day. Superstar Celebrations insert. Another concept I like. Not love, but like. Speaking of "Those were the days," wouldn't it be great to be a kid again with an imagination? Does anyone care about Opening Day? I'm guessing no. But it's affordable and I enjoy the inserts. I'm in a bit of a rush as I'm going on a trip very soon. So for a while, it's going to be lots of cards, not much discussion. But I'll reward you with a fun video at the end of the post! Fired Up is a great concept and if I wasn't so involved with Japanese cards I'd probably chase it. Markakis is one of my Player Collection guys, and while I only want flagship Topps it's fun to pull their cards. You "suffered" through seven cardboard scans. Here's your reward. If you can call it that! I'd love to do something like this if I ever return to the science classroom. If I kept my mental track right, I've opened 64 packs of Calbee including the cards below. That's 128 cards. A master set, excluding the lucky cards, has 124 cards. Do I have a master set? Nope. I don't have a full base set yet, either. But who expects perfect collation, especially when buying random packs from multiple locations? I mentioned before I'm pretty much done with bags of chips for Series 1, though I'll trade and buy for the cards I need next month (after my vacation). Did I get anything great in this last batch? The Hawks have two pitchers named Takeda. This is Masaru, a starter with a career 2.85 ERA. In case you didn't hear, Wladimir Balentien broke the single-season home run record last year with 60, almost doubling his prior two seasons. He has 11 already in 2014. Ginjiro Sumitani has a career .204 average, yet he's been the Lions' number one catcher since 2009. Except 2010, when he played in exactly one game, getting exactly one at bat. This pack of two has two doubles. I wonder if any of the catchers in Calbee's set are shown without their catching gear. Here's my first and only insert in the last six packs. Even the "common" inserts have been somewhat difficult to find - no checklists or League Champions cards. I managed to pull all three Japan Series cards, though, so I have a full set of that. It seems like I'm missing more of the inserts than I have, although I have half of the Starcard inserts plus several duplicates. Akira Nakamura had his breakout year last year after seeing limited play in 2011 and 2012. He answered by hitting .307 in 109 games. This year he's hitting .296 in 21 games so far. I need to confirm my Calbee checklists and then I'll post a summary/want list tomorrow! Getting Lucky with Calbee: 6 Packs Open, 6 To Go! I have never really thought of myself as a Taylor Swift fan, but I enjoy her music. This isn't my favorite from her most recent album, but you'll see why I'm including it when you get to the end of this post. I suggest you go ahead and skip the 2+ minute speaking intro and get to the song. Let's get another six Calbee packs out of the way, shall we? Something good is in store here after yesterday's lackluster bust. Today's cards are packed with pitchers, and this pack starts us off with two lefties. Okada had a good rookie year last year, serving in a relief position. Masanori Ishikawa has been with the Swallows since 2002. Never a really great pitcher, he's off to a rough start this year. Pack two has two righties. Kodai Senga is another reliever who had a great rookie season last year. Hideaki Wakui moved to the bullpen a few years ago and after being the closer in 2012 has served mostly as a middle reliever to give the Marines a couple good innings a game. Here's a good pack! Two inserts! After batting in the .230s for the prior three years, Sho Nakata hit .305 for the Fighters in 2013. He's been a bit of a power hitter, averaging around 24 home runs per season. This year his average is low again, though he already has five dingers. The card on the left is from the Japan Series, one of the insert sets... and at least it's a different card than the one I already have! Wait, what's this? I pulled a lucky card! Actually, it's a Rakkiikaado. I've already cut out and mailed the tiny tab in the corner to get my card holder and two special cards. You'll see those when I receive them - hopefully next month. Oh, and there's another Starcard! You've heard about Takahashi. Eishin Soyogi has had a couple of .300+ seasons since starting in 2006 with the Carp. Let's finish with two more pitchers, this time a righty and a lefty. Atsushi Nohmi (Atsushi Nomi) has been a pretty consistent pitcher with the Tigers with an ERA below 3.00 from 2009 through 2013 (career 3.08). He's 3-1 this year with a 4.78 ERA. I told you about Masuda before, the Marines closer. Well, six more packs down! And the "Golden Ticket" of cards, the lucky card, is mine as well! I'll bring you my (most likely) final six packs tomorrow. Calbee-ing Again: 5 More New 2014 Packs! More Calbee, With A Double Surprise! Let's Calbee: 11 More 2014 Packs!